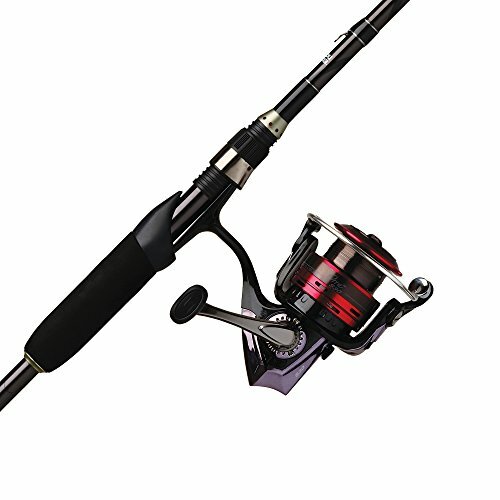 The next generation of Orra S spinning combos exemplifies sleek reel design and performance in a compact package. An aluminum reinforced C6 carbon body design seamlessly combines the X-craftic gearbox with a C6 carbon body. The result is a lightweight body that houses gears in perfect alignment. 6 stainless steel HPCR bearings + 1 roller bearing provide increased corrosion protection while maintaining smooth and consistent operation. The Rocket line management system provides better casting control of all types of fishing lines. Working in tandem with the Rocket spool lip design, this system actively controls the line coming off the spool during a cast for improved control and accuracy. A stainless steel main shaft and components improve corrosion resistance while the Everlast bail system delivers improved durability. The Carbon Matrix hybrid drag system delivers super smooth drag performance throughout the drag range. Paired with a 24 ton graphite rod equipped with stainless steel guides with Ti inserts, this package offers anglers a lightweight, balanced combo. Features:- Carbon Matrix hybrid drag system for super smooth reliable drag performance- Everlast bail system for improved durability- Stainless steel main shaft and components for improved corrosion resistance- 24 Ton graphite for a lightweight balanced design- Stainless steel guides with Ti inserts Specifications:Reel:- Reel Size: 30- Bearing Count: 7- Gear Ratrio: 5.8:1- Reel Handle Position: Right/LeftRod:- Rod Length: 6’6″- Mono Capacity Yd/lbs: 225/6, 175/8, 140/10- Braid Capacity Yd/lbs: 180/10- Drag Material: Hybrid- Max Drag: 12 lbs- Rod Action: Fast- Line Rating: 8 – 15- Rod Power: Medium- Lure Rating: 1/4 – 3/4- Rod Blank Material: Graphite- Rod Handle Material: EVA- Number of Pieces: 1- Number of Guides: 7- Guide Types: Titanium.